We’re going to try something new here on the blog… product reviews! Periodically we’ll post about something dental related that’s either new or has been around for awhile. You know how those commercials say, “4 out of 5 dentists recommend this product”… well, we’re definitely not a voting panel here, but sometimes our employees try new things and we want to spread the word! 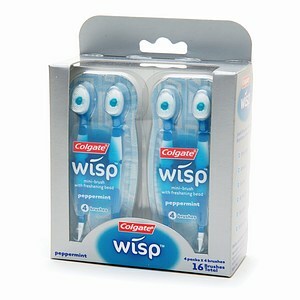 So, with all that said, have you heard about Colgate Wisps? When I first saw them in the grocery store about 6 months ago, I thought “What the heck is this?” as I picked them up and gave them a once-over. On a whim, and because I am an impulsive shopper, I decided to buy them and try them out. They’re actually pretty cool, and I swear Colgate isn’t paying me to write this blog post about them. Basically, it’s a little plastic toothbrush with soft, plastic bristles surrounding a little sugar-free flavor bead. They are great for on the go! I like to keep them in my purse in case of a breath emergency. How about after a nice big piece of garlic bread at one of Milwaukee’s finest Italian restaurants? Whip one of these guys out and freshen up that stinky garlic breath! Just be sure to still floss use a soft bristled toothbrush with some ADA approved toothpaste before bed, because this doesn’t replace proper brushing and flossing. The Colgate Wisps come in 3 flavors; Peppermint, Spearmint, and Cinnamon. My personal favorite flavor is Cinnamon, but the rest are not so bad either. Check them out at http://www.colgatewisp.com/wisp/HomePage. There’s also a link on their website that will take you to a 50 cent off coupon, and they are on sale at Pick N Save this week as well. Super deal! Comments Off on Disposable toothbrush, what? !